If you are lucky enough to have a master bathroom, it does not have to merely be an afterthought. Often seen more as a convenience than a symbol of decadence, the master bathroom can be seen as perfunctory and thus overlooked. You do your business in there, you know it is the one space where you can leave all your personal care items and know they will not be moved – especially if you happen to have children – and it can be nice to shower uninterrupted, not to mention convenient for middle-of-the-night necessities. 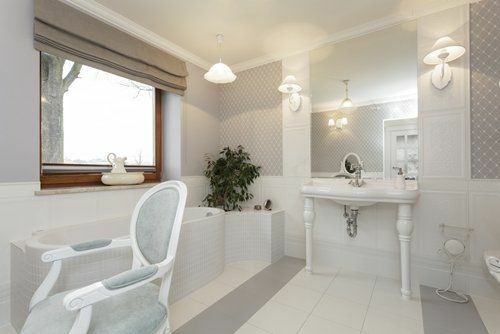 But why just relegate the master bathroom to be a well-placed room, far from the eyes – and use – of guests and others? Your next bathroom remodeling project can turn this space into a spectacular private space, if you are ready. Having a soaking tub can be wonderful, but many people prefer to have a high end shower. According to the 2017 Houzz Bathroom Trends Study, homeowners want that gorgeous shower – and they are making it the top master bathroom feature. Over half of those who participated in the Houzz survey are making their showers larger and 81 percent said that they are remodeling their bathroom to fit a more modern, luxurious shower. And people want fancy features in their showers. Of those surveyed, 12 percent of respondents indicated that they were going to install mood lighting or digital controls. If you want more inspiration, it can be helpful to know that alcove showers are homeowners' current top pick, as 55 percent indicated as such. So go ahead and add that great shower to your master bathroom: 42 percent of respondents chose to do the same. Depending on the space, you may want to look for a free-standing bathtub and take inspiration from some of the homes featured by Architecture Art Design. These tubs not only look glamorous, but also can often have a unique shape, which elevates the master bathroom profile. A more curved, bowl-like bathtub as featured by the source can present a soothing, spa-inspired vibe, whereas something more square can give the room a modern feel. Renovating a bathroom can feel a little daunting at the best of times, TMS Architects noted, so take the space in portions. Adding more expensive but small elements to the room can also give it the level of luxury you desire. For example, if tiling an entire shower sounds scary, think about adding marble or quartz-topped counter spaces, chance the paint to softer, more muted colors, or upgrade the bathroom fixtures to more contemporary models. For more advice, you can speak a professional at a kitchen and bath showroom, who can help you decide where to start. Making your master bathroom more special can be a fun project. While so many parts of the home are very public, your efforts can yield a special space where you can relax and know that it is truly yours.